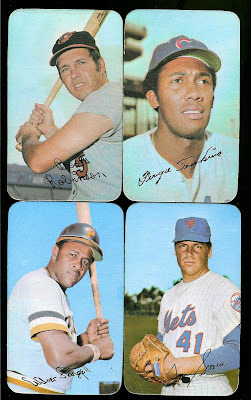 Between the years of 1969 and 1971 Topps released an over-sized set of baseball cards called Supers. I found a handful of 1971's. These cards measure 3-1/8" x 5-1/4" and are printed on super thick cardboard and feature rounded "corners". Which is a good thing because all these years later even the rounded corners are prone to layering as the cardboard layers peel. The complete set consists of 63 cards depicting 42 players with the key cards being #18 Willie Mays, #37 Roberto Clemente, #49 Yastrzemski, and #56 Hank Aaron. Originally sold in packs of 3 for $0.10. I didn't find any of the key cards but of the total ( ) we found, here are a few of the better players. Beginning in 1970 Kellogg's the maker of such timeless cereal favorites as Corn Flakes and Frosted Flakes began inserting baseball cards into cereal packages. Featuring a 3D design printed by a company called XOGRAPH, the cards became extremely popular with kids and started a successful 14-year run. I found cards from 1970,1971, and 1972. The set from 1971 was the largest at 75 cards with inaugural year being the smallest at 48 cards. 1972's set settled in with 54 cards, although an additional All-Time Greats set of retired players was produced with an additional 15 players that same year. Under-sized at 2-1/4" x 3-1/2" the set features some of the biggest names in the game, like Pete Rose, Reggie Jackson, Roberto Clemente, and Ernie Banks to name a few. In 1972 the cards were re-sized to 2-1/8" x 3-1/4" where they would stay for future releases. Below from left to right are my favorites from 1970, 1971, and 1972. In total there were (5) 1970's, (4) 1971's, and (2) 1972's. This 'old school' collection is turning very impressive!! 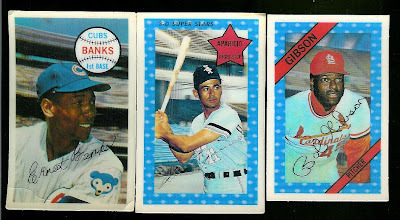 Quite the history on the Kellog's insert cards! !